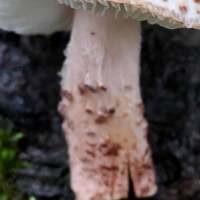 Several other dapperlings are superficially similar to the Deadly Dapperling Lepiota brunneoincarnata, whose scales, on both cap and stem, are quite variable. Like so many other small dapperlings Lepiota bruneoincarnata is a terribly toxic toadstool - it is known to have caused several deaths in recent years..
A rare find in Britain and Ireland, Lepiota brunneoincarnata occurs also on mainland Europe and in temperate parts of western Asia. This mushroom was first described scientifically in 1889 by Swiss mycologists Robert Hippolyte Chodat (1865-1934) and Charles-Édouard Martin (1847-1937), who named it Lepiota brunneoincarnata; this remains its generally-accepted scientific name. Lepiota, the genus name, comes from Greek words Lepis-, meaning scale, and -ot, meaning ear. Scaly ear fungus is an interpretation, therefore. 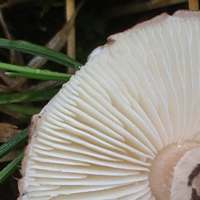 Scales on a convex (vaguely ear-shaped, perhaps) cap are characteristic of fungi in this genus, as also are free gills and a stem ring. The specific epithet brunneoincarnata is a reference to brownish-pink (literally 'flesh coloured but with a brown tinge') cap colouring. Initially hemispherical, becoming broadly convex and sometimes almost flat with a slight umbo; pinkish-brown felty surface eventually breaks into fine woolly scales often forming irregularly concentric rings, paler and more widely spaced towards the margin; flesh white. Cap diameter at maturity ranges from 2.5 to 6cm. 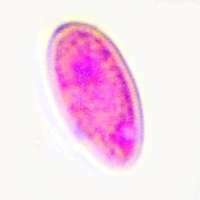 The free, crowded gills are creamy white, and the cheilocystidia (gill-edge cystidia) are cylindrical or narrowly clavate. Creamy white with a pink flush, 2.5 to 5cm long and 5 to 9mm diameter; flesh white. The upper half is smooth while the lower stem, below an indistinct woolly ring, is decorated with dark-brown fibrous scales. 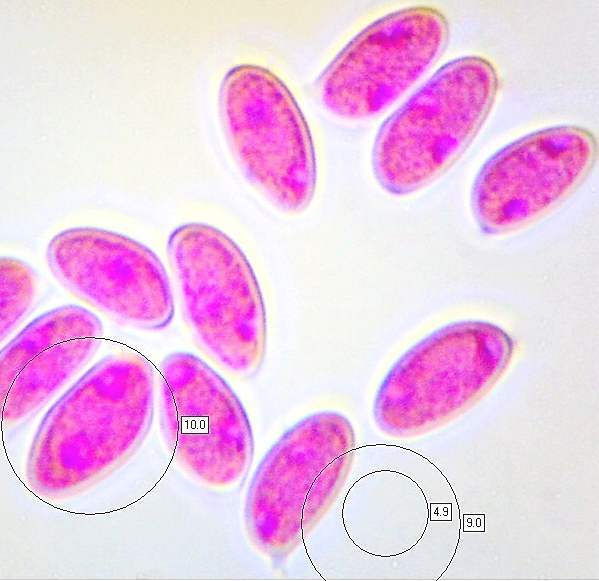 Ellipsoidal; smooth, 8.9-10.2 x 4.8-5.5μm; dextrinoid. Odour faint, fruity. Deadly poisonous: do not taste. Saprobic, usually in small groups in broadleaf and mixed woodlands; also occasionally in sand-dune grassland. July to November in Britain and Ireland. 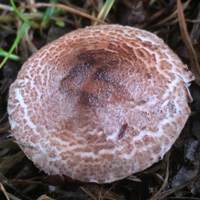 The Fatal Dapperling Lepiota subincarnata is similar but more pinkish; its spores are very much smaller than those of the Deady Dapperling. Lepiota ignivolvata has a bright orange or red-brown ring low down on the stem. 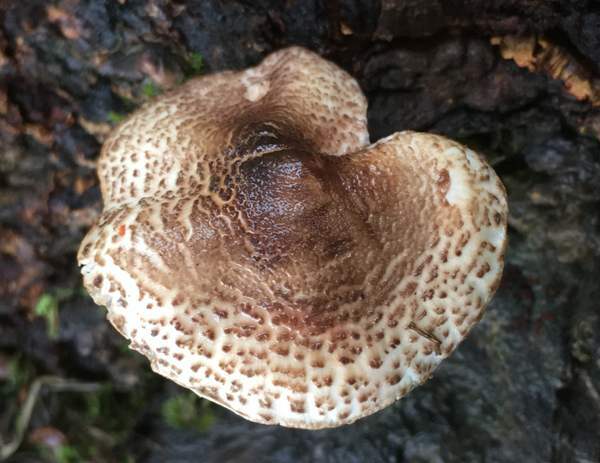 Lepiota cristata is typically larger with brownish scales. This is a deadly poisonous species. 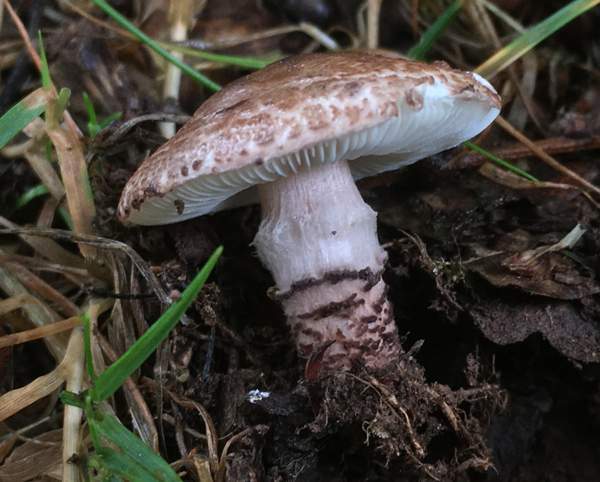 It is my opinion that there are no dapperlings worth collecting to eat, particularly because confident identification in the field is very difficult and this species and several others are also seriously toxic toadstools. For example, Lepiota cristata the Stinking Dapperling is poisonous and could be mistaken for a small edible Parasol Mushroom Macrolepiota procera. If what you believe to be Parasols are smaller than 10cm in cap diameter then check very carefully, because it is possible that they are actually poisonous Lepiota species. This page includes pictures kindly contributed by Simon Harding.